This post is in collaboration with Parmesan.com. Thank you for supporting the brands that make this blog possible! Sweet potatoes used to be my nemesis. I was probably the most picky kid around, and I used to give my mother such a hard time about eating, well, everything. In fact, she put honey on an orange once, so I would eat it. Honestly, what kid doesn't like oranges? I have no idea what was wrong with me... Sorry, Mom. I don't know that my mom ever actually made sweet potatoes when I was a kid (can you blame her, with a child like me? Also, they were not the golden child of vegetables then, like they are now), but once, when I was 6 or 7, I went to a neighbor's house for dinner, and we had baked sweet potatoes. I remember being completely repulsed, and decided that I never wanted a sweet potato again. Fast forward 15 or so years, and I made these sweet potato tacos that Janssen recommended. I honestly have no idea why I made them, because they really weren't my style, but I am so glad I did, because they were SO good, and the sweet potato added so much to the dish. So soft, delicious and flavorful. Eating those tacos was really a turning point in my food journey. The part where I started eating vegetables willingly (beyond lettuce and green beans, that is). This particular dish, is lovely. 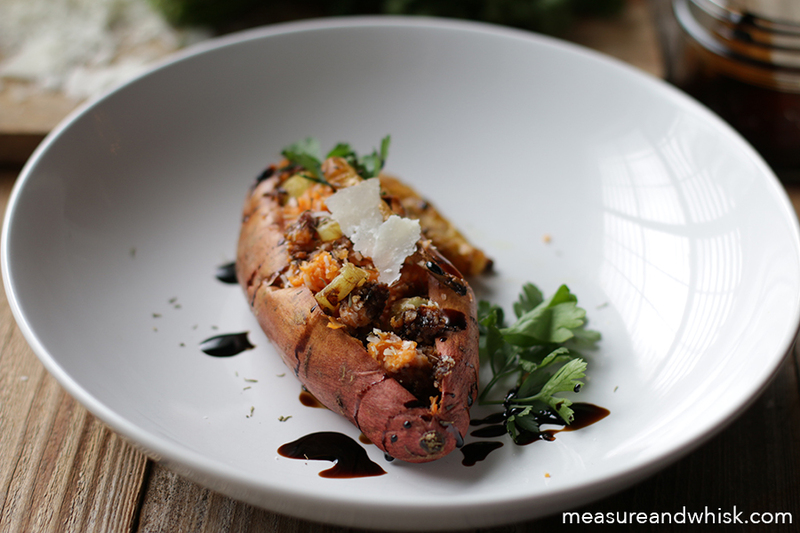 It is really a great way to enhance the already delicious sweet potato. I used real parmesan cheese, which is a necessity for the best possible flavor. Look for the pin pricks on the rind for the very best quality. 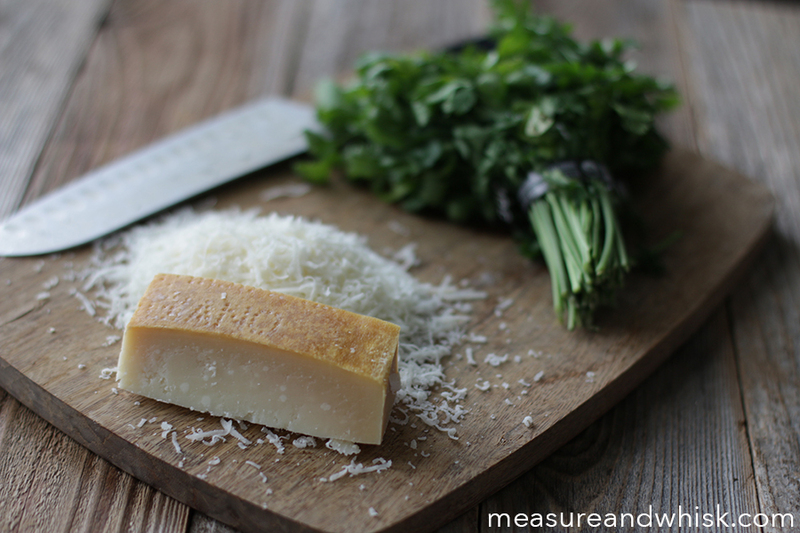 It is often called Parmigiano Reggiano on the label. I also use some carrots for added flavor, texture and nutrients. A balsamic reduction finishes it off perfectly. The cooking part takes a while, but other than that, it is pretty hands off, and the final result is stunning and tasty. Place your sweet potatoes on a baking sheet lined with a silicone mat or foil, leaving a nice space for your carrots (they will go in a little later). Poke your sweet potato with a fork or knife in a few different places around the sweet potato to help release the steam (otherwise your potato will blow up in the oven). 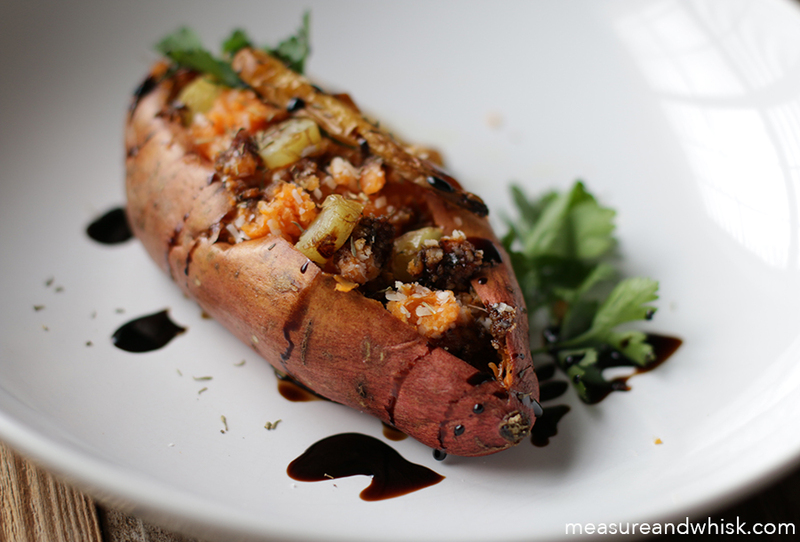 Place your sweet potato in the oven for about 25 minutes. After your timer goes off, pull your baking sheet out of the oven. Very quickly, add your carrots to the baking sheet, drizzle some olive oil on them, then sprinkle them with thyme and sea salt. Put them in the oven and set your timer for 25 more minutes. In a small saucepan, heat the balsamic vinegar until it begins to boil (turn on your vent fan, so you don't pass out from the fumes...), then turn down the heat to a simmer, and stir occasionally until it has thickened. Remove it from the heat, once it is thick and set aside until you are ready to use it. Pull the sweet potatoes out of the oven, cut them down the center, and remove the soft inner flesh of the sweet potato, and put it in a bowl. Let the carrots cool slightly, and cut them into wheels, then add them to the sweet potato filling. Add the parmesan cheese, a few shakes of sea salt, and the carrot wheels, and mix until combined. 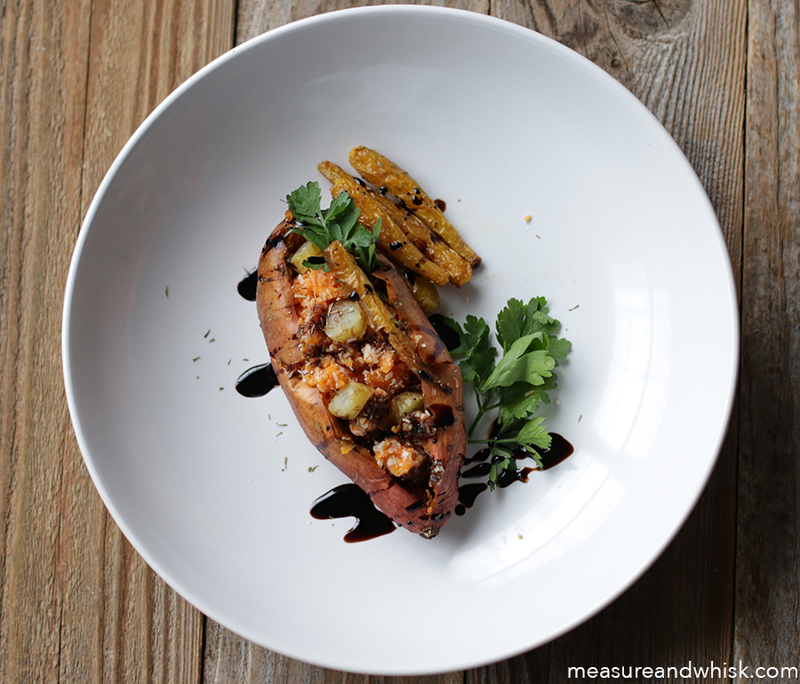 Put the filling back into the sweet potato skin. At this point, you can put it back in the oven, if you want the filling to crisp up a little (I didn't), or drizzle with the balsamic reduction and garnish with parsley (if you are doing this step) and serve immediately! Enjoy!